Are you considering the Ramsey as your lift chair? This guide will walk you through facts about the Ramsey lift chair, its price, reviews, warranty, and give you a conclusion. Read on to find out how the Ramsey compares to other lift chairs on the market. 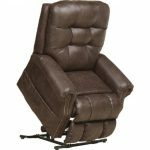 The Ramsey is a 3 position lift chair that has faux leather. It features Catnapper’s coil and gel seat. The chair comes with heat and massage. It is 42 inches deep, 46 inches wide, and 36 inches long. There are no found reviews for the Ramsey by Catnapper. The chair costs $1,199. This is $135 above the average price for a 3 position lift chair. Catnapper will cover the lifting mechanism, spring, and frame for the lifetime of the first owner. The seat is covered for 5 years and the motor for 3 years. The labor and shipping costs are covered only for the first year. After that, the purchaser must pay for the labor and shipment to the Catnapper factory for repairs. The Catnapper Ramsey is an overpriced lift chair. For its price, one can buy a 3-position lift chair upholstered with leather. The Ramsey is upholstered in faux leather. The warranty is above-average. We rate this chair 4 out of 5 for it is about the average price for a 3-position lift chair. Buy on Amazon. Have a lift chair for 2 wks over a year and the brains of the chair went out. The furniture store we bought it from sorry we will tell there repair man to call you. Well we paid them 1200.00 for the chair. It has been two weeks and have not heard from the guy since he cam and told us what was wrong. I want something done about this chair and if the store will not stand behind it then Do NOT ALLOW THEM TO SELL THEM.and it was not a box store either.